Discover a few of the benefits of marble kitchen countertops. One of the most important aspects of any kitchen are the countertops that you choose to install into the space. Since kitchen countertops are used daily for a variety of tasks, the material you choose needs to be highly durable. One of the strongest and long lasting materials on the market is marble, which is popular among homeowners. Discover a few of the benefits of investing in marble kitchen countertops for your home. When it comes to kitchen countertop materials, marble is one of the most durable materials on the market. Since it is a natural stone, it is resistant to scratching, cracking, and other forms of damage. So, it is the perfect material to prepare food on for cooking. You will never have to worry about damaging your marble countertops while making a meal for your family. One of the more unknown benefits of marble countertops is that they are heat resistant. 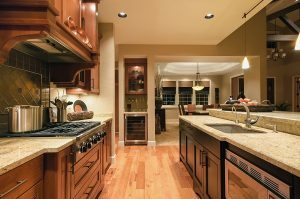 So, if a fire occurs in your kitchen, it will not spread and burn on the countertops. It is critical to know that you should not place a hot pan or pot on your marble countertops. Putting a hot item directly on marble will damage the finish, so you should put any hot item on a heat resistant surface. Once you install marble countertops into your kitchen, it will immediately enhance the entire room. Each piece of marble is unique, and the specific color is determined by the area it was mined from. The finishing process brings out the natural colors of marble so you will have a bold and aesthetically pleasing countertop. Your marble countertops will be the focal points of your entire kitchen. This entry was posted on Monday, March 12th, 2018 at 11:18 am. Both comments and pings are currently closed.